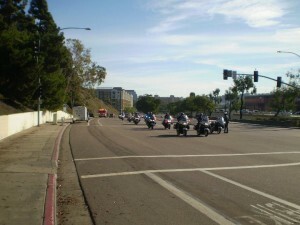 How a Motorcade Reaffirmed My Mission to My Clients | Your Voice, Inc.
. Tags: Adding value, client recognition, Client Relations. 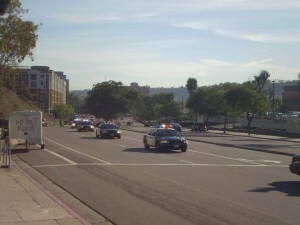 This morning I took a walk down the street to watch the motorcade honoring a fallen San Diego police officer killed in the line of duty. My motivation was to capture the moment and to spend some time remembering a friend of mine, Detective Larry Steward, who died not quite two years ago. Larry had been killed by an “alleged reckless driver” and because he was off-duty at the time of his death he did not have a motorcade of this magnitude. After watching the beginning of the procession I started back up the road and took the turn to go up the hill to my street. Because the main road was dedicated to the motorcade, the side street leading up the hill was backed up with cars for what looked like half a mile. The morning news had indicated the ceremony involved more than 500 official cars and it would last approximately one hour on its way through town to the memorial service. As I walked passed the stopped cars I noticed some drivers on their phones looking angry, others were trying to find a way out and most of them were in a state of frustration. They apparently did not know why they were stopped and when they would be free to go on their way. I decided to walk in the middle of the two lanes and start informing the drivers what was happening and how long it would last. I encouraged them to take advantage of the freeway onramp that was next to them and find an alternate route. Within seconds of finding out what the cause of delay was, their state and physiology changed. It was hard to be mad at the circumstances. In addition, they were now informed, they understood and they could take control of their situation. Many thanked me, smiled and found their freedom with an alternate road. As the initial cars started to move out of their lanes, each car behind them rolled down their window and waited for me to answer their questions. It did not take long for many of the cars to follow suit and without even speaking to them, I received waves and thank you’s as I made eye contact and motioned for them to use the onramp. As more cars, city buses, and postal trucks came down the hill and began to stack up, I started the routine all over again. I knew I would not be getting back to work when I had planned. This was going to take a while. When the road was finally opened up to traffic I headed back up the hill. As I made my ascent I felt great. I had taken the time to change frustration into gratitude. I had been able to help people move along with their plans and get unstuck. I had done what I would want someone to do for me. I realized that a simple gesture and a few extra minutes meant a great deal to others. It was then that I thought about my clients. Sometimes they come to me frustrated and feeling stuck because they don’t have the knowledge or enough information to find the solution on their own. As consultants we often spend extra time providing explanations and education beyond our traditional services. It does not fall under “billable” hours or within the scope of work detailed on our contracts, but it is necessary to be a part of the solution and change frustration into gratitude. You (and your talents) have the unique ability to provide your clients with peace of mind. You can go the extra mile and have an affect on their state and physiology – or you can walk passsed the line of frustrated drivers and not make eye contact. It is your choice. Great post!!! You did the right thing, and although I am not among those you assisted with information, I appreciate the connection of treating our real estate clients in a similar manner. Thank you for your kind words, Joe. Real estate transactions can be very stressful. Having gone through it myself, I appreciate that you connect with your clients in a way that eases their frustration.